Sometimes a book appears in your life exactly when you need it. This is completely the case with The Four Agreements, it has been a life changing read, and a book I find I re-read at least once a year now. 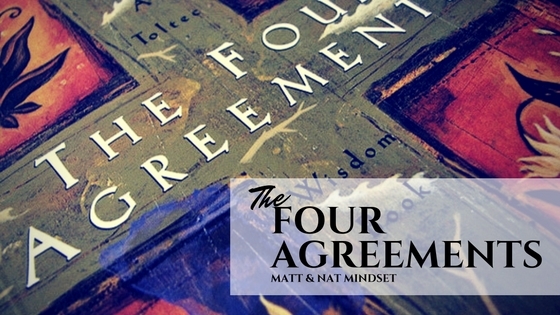 The basic premise of the book is that we all make agreements, with ourselves and with others, and many of these agreements are put upon us by our parents and other adults in our lives as we are growing up. A lot of these agreements we haven’t actively agreed to take on, yet we do. For example we are happily singing one day as a little child and our mom has a headache and says without thinking “Stop singing you have such a shrill voice and it hurts my head” we then take on the agreement of “I have a bad voice, I shouldn’t sing” and we may stop singing for years, or maybe forever. . . even though it was something that brought us so much joy! Be Impeccable with Your Word – speak with integrity, especially with your inner voice to yourself, and don’t gossip. Don’t Take Anything Personally – realize that nothing others do is because of you, it’s a projection of their own reality. Don’t Make Assumptions – find the courage to ask questions and state clearly what you need. Always Do Your Best – recognizing that your best will change from day to day. It always amazes me how simple these sound, yet in the beginning when I was trying to live them it was eye opening to see just how often I take things personally, or assume things, or how easy I found it to slip into gossip or drama. However when I take a moment to focus on living The Four Agreements I find my mind quiets and I can focus on being present so much easier. The one point don Miguel makes that always really hits home is that we are the only species to play the role of both Judge and Jury in our minds. That is we do something that we are not happy with and we judge ourselves and then we condemn ourselves for the act. And worse than that we do it over and over and over again, for the same event, and we do this for many many things. How often do you replay things in your mind? For me it was chronic, “I should have said that. . . why didn’t I say that, now they’ll never take me seriously because I said that” and so on and so on. . . all day long! The other lesson I learned from this book is very little that happens with other people is about us. That is the way another person treats us is a reflection of the agreements that they have made in their past and not a reflection of what they truly think about us. And if I don’t understand why someone has said something or acted in a certain way it is up to me to not make an assumption but to ask them what they meant. This has been huge for me, so often I would be offended by something someone said, yet when I asked for clarification how I was interpreting it was based on my old agreements and their intention was not at all what I was assuming it was! There is so much in this book that fits nicely with what you are learning in Thinking Into Results. I found this book so helpful with my self-image and with communicating more clearly – it is now much easier to respond to people’s words as opposed to reacting to them. If you have a very noisy negative inner voice this book will give you the insight on how to quiet it and it will give you the tools to replace that voice with one that is more positive and loving. If you would like to add this gem to your library you can purchase it on our store. I can guarantee it will be a book you return to again and again. Mental Blocks – What’s really getting in your way? Enter your info below to receive 8 thought provoking questions that warrant your attention.